Ali: first, yes, a cowl is a circular scarf - no ends! Some have twists, some don't. 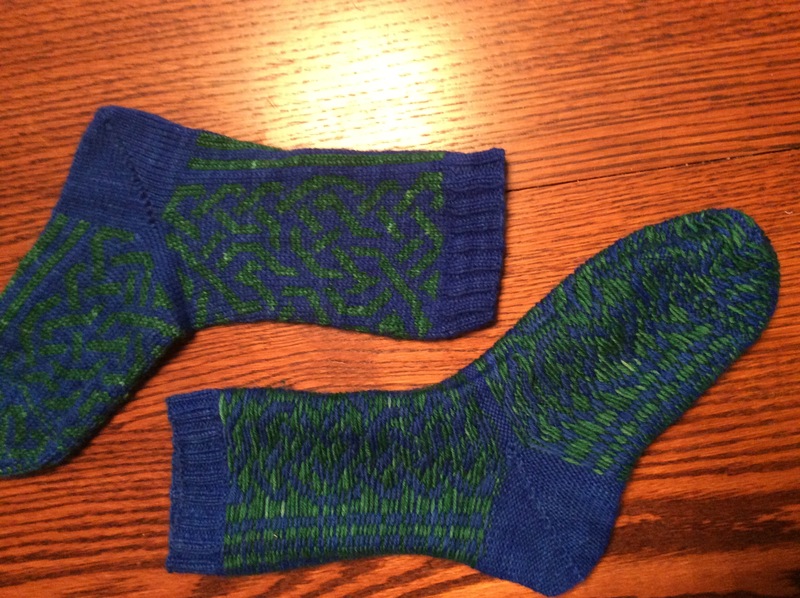 The sock on the left is inside-out, the one on the right is not. You carry the unused color along; if the float is longer than about 1", you twist the 2 yarns together to catch the float so you don't get your fingers/toes caught in it. You *can* see the image on the inside, but it's kind of blurry. Homestead: Got my new washer yesterday.....I gotta say, I LOVE it. It's a Speed Queen (yup, just like what the laundromats use! ), and it's just a basic machine; no frills. NO electronics, either. :grin: AND!!!! A wash cycle is only 30 minutes; the Maytag took a little over an hour. :shakes head: It has an agitator, but at this point? I don't care - it has a SOAK cycle! And *I* can determine how much water it uses. Happy, happy over here! Kiln: Got the plug put in yesterday.... but something has gotten out of whack on the kiln. :sigh: I am putting off going into the controller, but I know it needs to be checked out. Paragon has a nice troubleshooting guide that should help.....but I don't wanna tear into it! :Sigh: I know it worked when we bought it; I think something got jarred loose either in the trip home or while it sat. It comes on, but the board reads "PF" instead of "IdLE". :gulp: Pray it's only a loose connection, please. a First and GRAND CHAMPION!!! 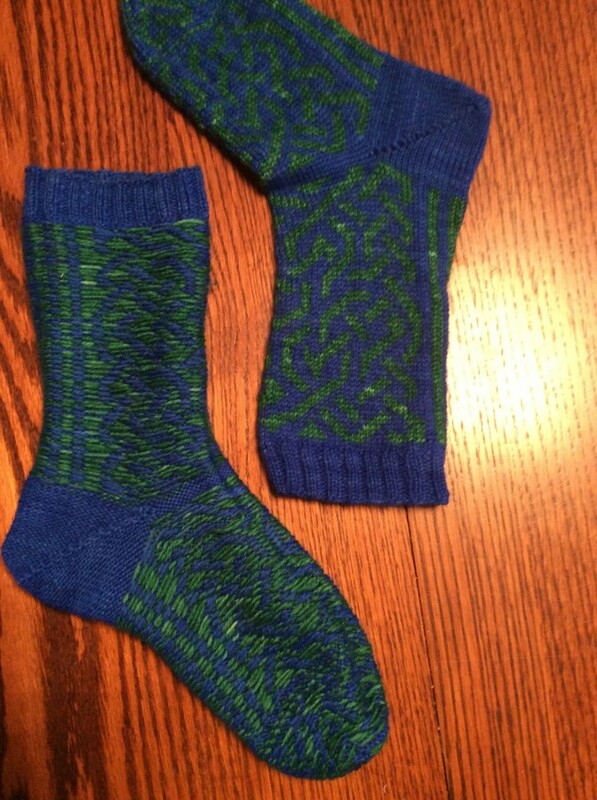 for Herself's Firebird socks. Gotta get moving - Shabbat's coming up fast, and I have to get dinner started and the table set. Shabbat Shalom!!! I promised you Fair photos, so Fair photos you shall have. :lol: Behind the cut, because...well, there's a lot of them! There were maybe 60 photos. SG entered 4. His night photo got Best in Category (1 other entry), his macro photo got Best in Category (1 other entry); his landscape got 1st (about 10 other entries, I think); and his flora entry got Honorable Mention (about 6 other entries). Not bad, but.....not a whole lot of competition, y'know? Herself's art didn't have much competition, either. Usually, the schools require ALL Art students to enter.....if that's still the case, then there are just NO Art students any more. AT most, across ALL levels, there were 40 entries. (Again, child/junior/senior/adult. Child/junior/senior are ALL school-aged kids.) Her "life and death" got Honorable Mention, and her "Phoenix" got First. There were NO crochet entries, 2 (yes, only *2* - we have a VERY active Quilting Guild out here!) Quilts, 3 total sewing projects, 1 bar of soap, 2 Lego models, 3 sculptures (all school kids), about 10 food entries......dismal. What? It's true...I have managed to get the tractor stuck. Not in the mud, no, that would be *too* easy. No, what I have done is the height of stupidity - even for *this* blonde. What did I do, you may ask. Well.......let's start at the beginning, OK? Anyway, that's it for this intrepid idiot. Tune in next time for more fun-filled idiocy from your local Fiberaddict! I just printed out the info for this year's County Fair. They've gone up on their entry fees - they've doubled this year. Yeah, $2 isn't much.....but. See, the entry fees come out of my discretionary fund. It's not big, and I use it for the "fun" stuff - vacations/zoo visits/movies..stuff like that. I have a set amount each month I try to not exceed it (and usually fail miserably, but...:grin:) Usually, it's not a problem. This year, it is. We've got a LOT of trips planned this year - we're going to Houston, naturally, but also Galveston, San Antonio, Austin, Big Bend, Longview....right now, we have about...10 trips planned. Most weekend ones, but still - hotel rooms, gas, and food all add up. Yes, Sweet Geek will help - but I will NOT allow him to foot the bill for all these trips. I just don't want to be accused of not entering out of fear I won't win - I DON'T CARE about that. Yes, we have a guild now - I hope EVERY member enters something - especially handspun yarn (there STILL isn't a category for that - I looked 3 times :sigh:). I won't have my handwoven jacket finished - I can't sew, and haven't had the time to find someone who does to convert my yardage into a jacket yet. :sigh: Guess I need to see what the trip schedule is - if we have a destination the weekend of the fair, then my decision's made - I won't enter anything. If not, then I'll see what I can get done. Fun stuff.....and now, back to the hat! Whew! Is it Monday yet?